In 1996, 408,000 Sri Lankan women, nearly 10% of the country’s working-age women, worked abroad, many of them in the oil producing countries of the Persian Gulf. In this paper I compare the influence of international migration on local hierarchies of class and gender in two villages in southern Sri Lanka: a Sinhala-speaking Buddhist village where I did my doctoral dissertation research in 1992-4, and a Tamil-speaking Muslim village where I spent some time during the summer of 1997. I discuss the challenges of using ‘class’ as a unit of analysis in a non-Western setting where gender identities, family ties, caste solidarity, religious allegiance, and ethnic affiliation also shape economic relations. Bringing female domestic servants into the global economy revolutionizes local understandings of both class and gender. Although it receives recognition as ‘work’, housework and childcare remain ‘women’s work’, and women’s internationally accepted gender status as unskilled, ‘supplemental’ family wage earners justifies meager salaries for housemaids. High Sri Lankan demand for scarce jobs in West Asia drives wages down and agency fees up, keeping housemaids ‘working class’ in the global economy. Isolated in the homes of their individual employers, migrant housemaids nevertheless are evolving a nascent class consciousness through their struggles with local Sri Lankan middlepeople and through retold stories of conflicts with abusive employers. Religious and ethnic differences between the Sinhala and Muslim villages affect the extent of class solidarity. The paper investigates how patterns social stratification, such as religious and ethnic practices, caste statuses, and gender roles affect the emergence of class identity in two villages in Sri Lanka. 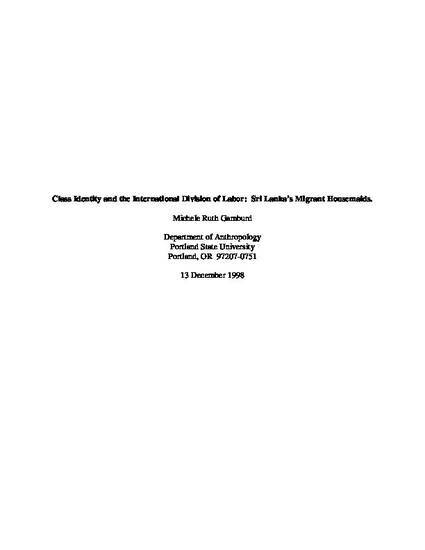 This is the pre-peer reviewed version of the following article: Gamburd, M. R. (1999), Class Identity and the International Division of Labor: Sri Lanka's Migrant Housemaids. Anthropology of Work Review, 19: 4–8, which has been published in final form at: http://dx.doi.org/10.1525/awr.1999.19.3.4.